We recently got back from our first ever trip out of the country together and wow. Wow. Wow. Wow. That’s pretty much all we can say about it. Wait, no, that’s not right. We have a lot to say about it! Those are just the first words that come to mind. There’s more, though! 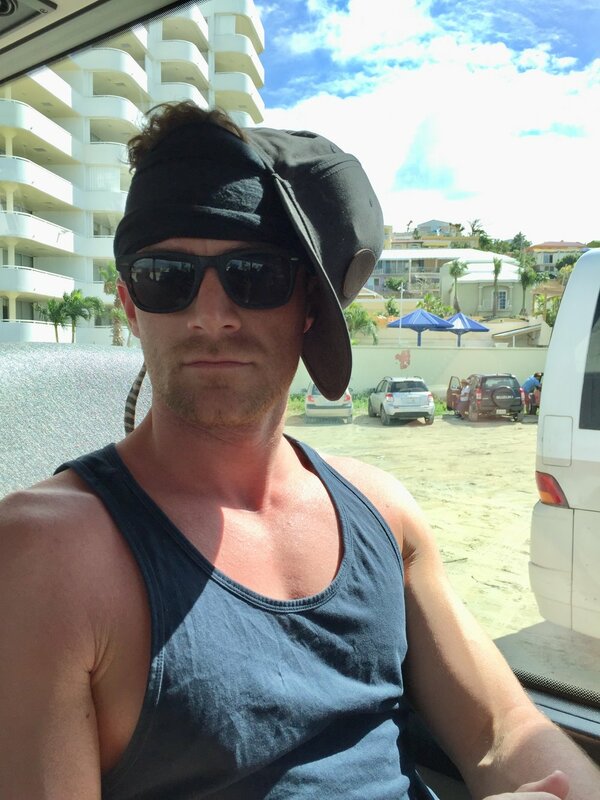 We went on a Caribbean cruise with our good friends Beau & Matt from ProbablyThis and had a blast. 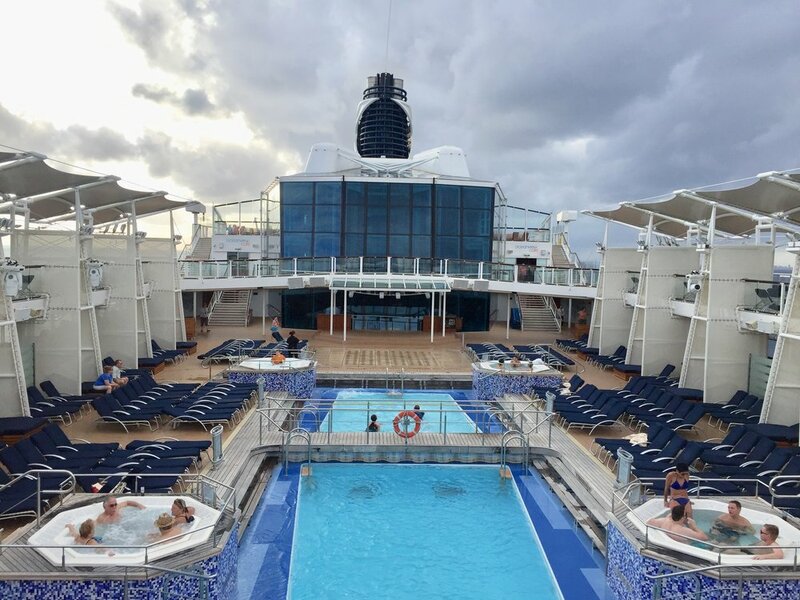 Celebrity Cruises was kind enough to host us on board the Equinox for a seven day cruise (be sure to check out the hashtags #sweetheartsatsea for some fun photos!) 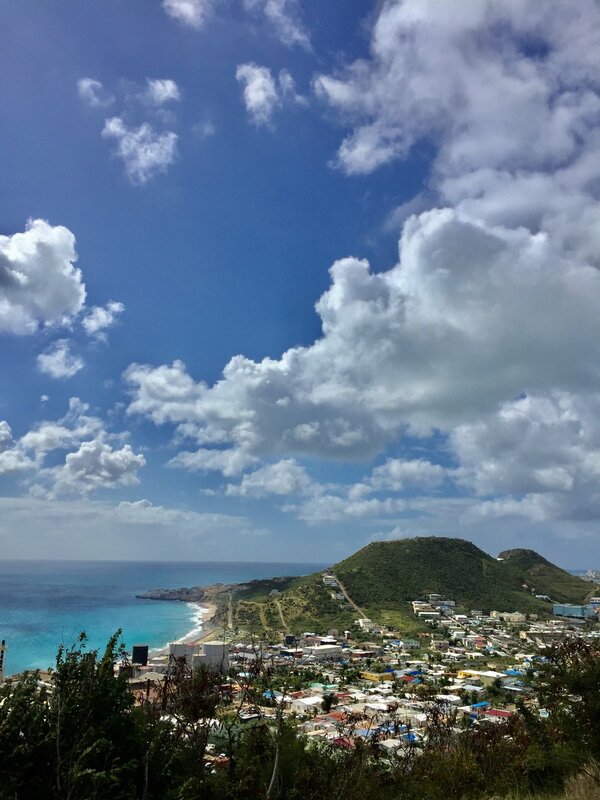 where we visited San Juan, St. Maarten, and St. Kitts – three of the most beautiful old cities and beaches we’ve ever been to. 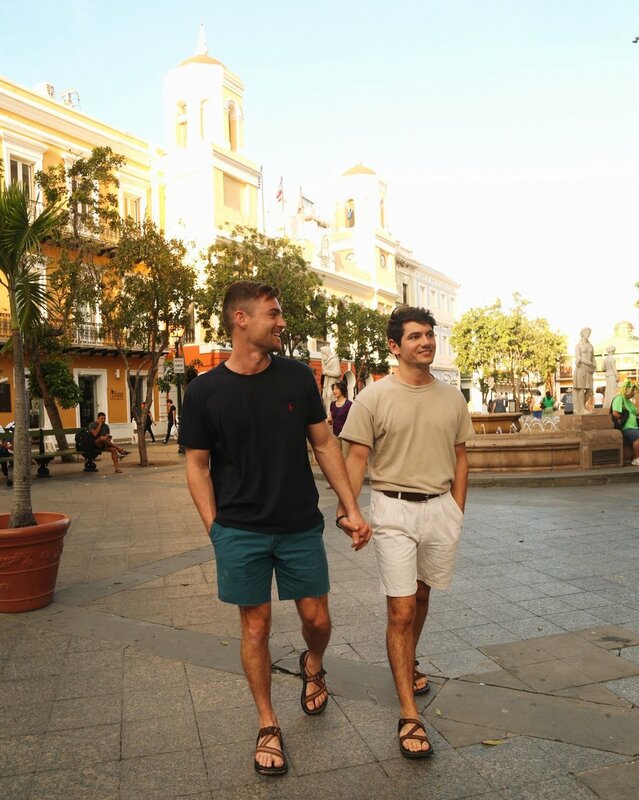 The old cobblestone streets of San Juan had us feeling nostalgic for a time and place we’d never been to before. The beaches of St. Maarten and St. Kitts were breathtakingly gorgeous. Why did we wait so long to go to the Caribbean? First, the ship itself is so cool. It’s ginormous and has everything you can think of on board and more. 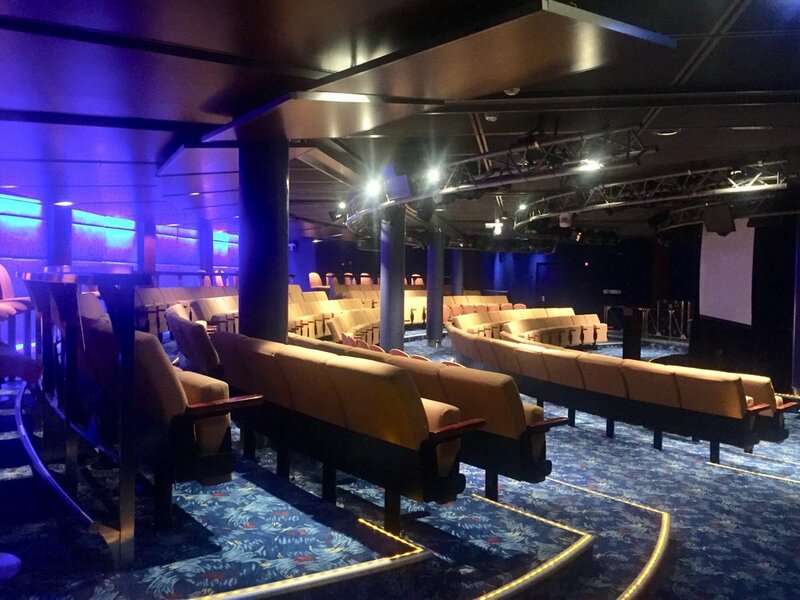 It has a movie theater, a casino, a library, multiple bars and restaurants, a café, a cafeteria, an indoor and outdoor swimming pool, a gym and spa, and even a grass lawn on the top of the ship. The cafeteria is open until midnight, so you know we were snacking all day. One night, at 11:45p, we went up there and ate pizza and dessert just because we could. And it was glorious. 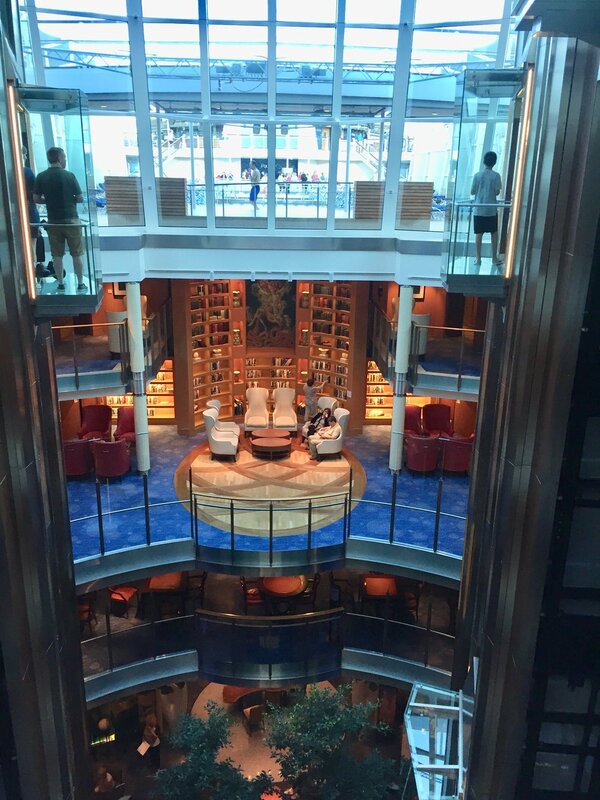 It took us a full 3 days to visit almost every part of the ship, as we discovered new floors and areas almost every day. One of our favorite areas to chill by far was The Lawn Club on the 15th deck on the stern of the ship. Oh, that’s another thing. You’ll have to get familiar with the words used to describe ship directions (stern, bow, starboard, etc). We heard them a ton on this trip and had no idea what they meant at first, but did our best to learn them by the end of it. But back to The Lawn Club! It was this huge yard, basically, of beautiful Bermuda grass where you could lay out and relax and work on your tan. There was a bar serving you ice cold drinks and blue skies/ocean views everywhere you looked. Is this what heaven will look like? Other than the food and various fun parts of the ship, we had so much fun on the port excursions. 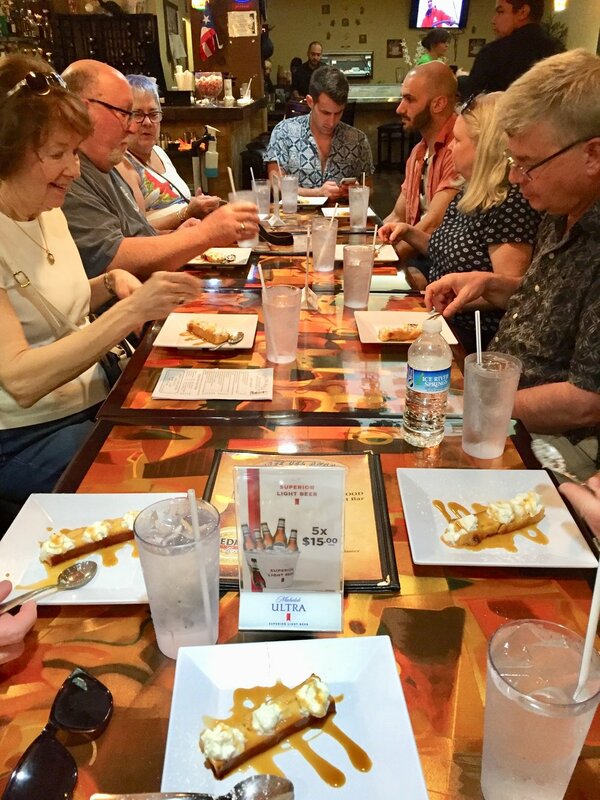 The first day we stopped at San Juan, Puerto Rico and went on a food & walking tour of the old city. 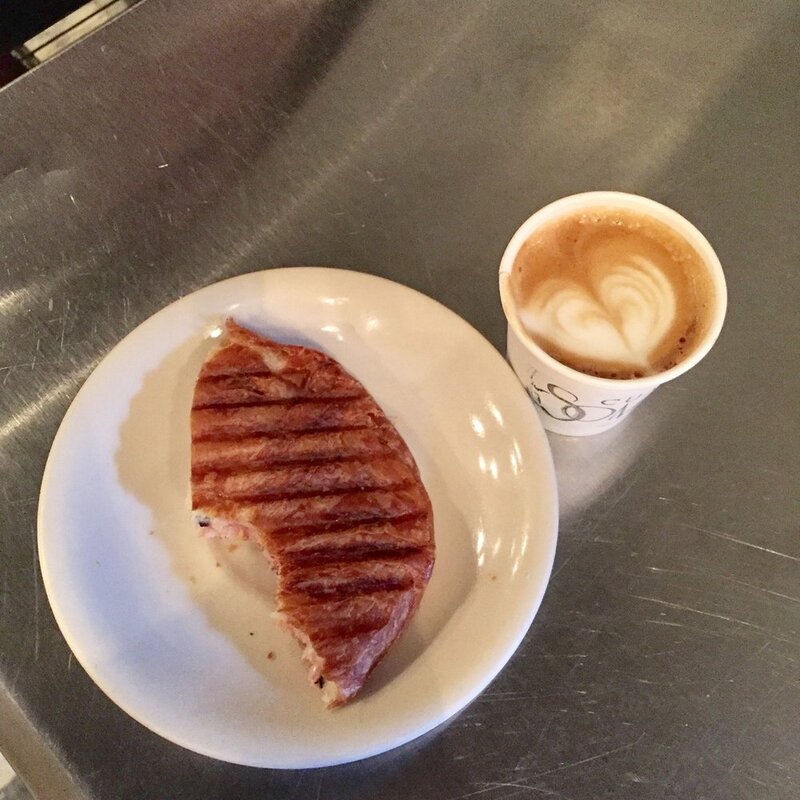 We drank Puerto Rican coffee, enjoyed some local dishes (and got to make our own mojitos! ), and ate some flan, which we haven’t had in forever. 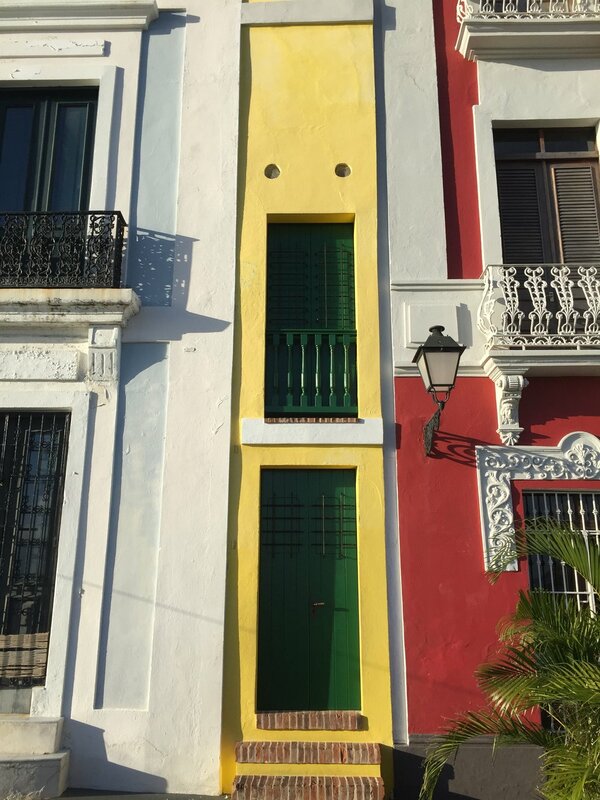 The old buildings and charming cobblestone streets of San Juan stole our hearts. It was hot and humid, but the tour guide told us it was their winter. It was 80 or so degrees! As you know, Puerto Rico was hit so badly by the hurricane and it devastated much of the island. Tourism is a billion dollar industry there and helps their economy immensely, so they want everyone to know they are back in business and gladly welcoming tourists to the island. It’s a beautiful place and we plan on going back as soon as we can. 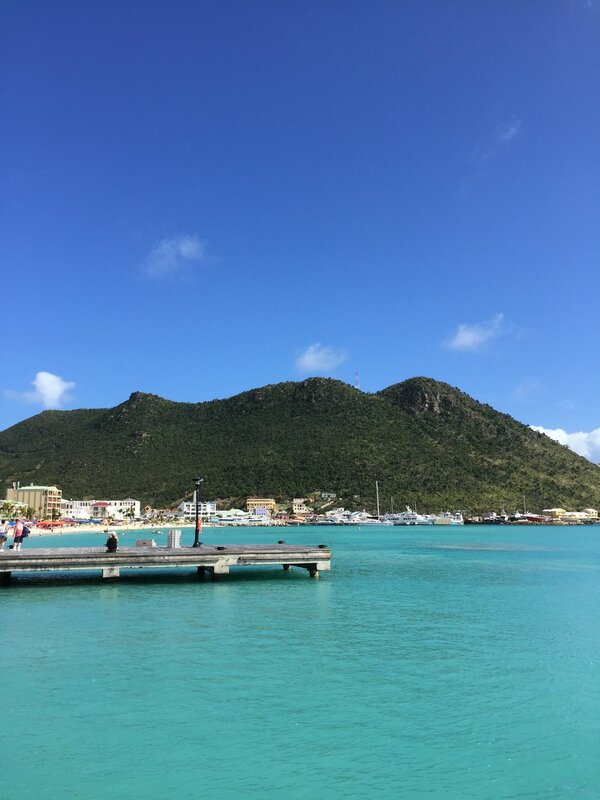 The next port day was in St. Maarten, which is the Dutch side of the island, not to be confused with St. Martin, the French side. This island was also hit badly by Hurricane Irma and we saw a lot of destruction that it caused. It was heartbreaking to see, but also inspiring to learn how the locals are coming together to rebuild and grow again. We went to Kim Sha Beach where the water was a beautiful turquoise and the sand was snow white. We luckily had gorgeous weather most of the time, though there were a few scattered showers here and there. St. Maarten marked the first time Thomas officially stepped off of U.S. soil and into a foreign country! For lunch we had shrimp tempura on a French baguette and it easily became one of our favorite meals on the trip. After we walked around a bit, we all loaded back onto the ship and headed towards the next port. 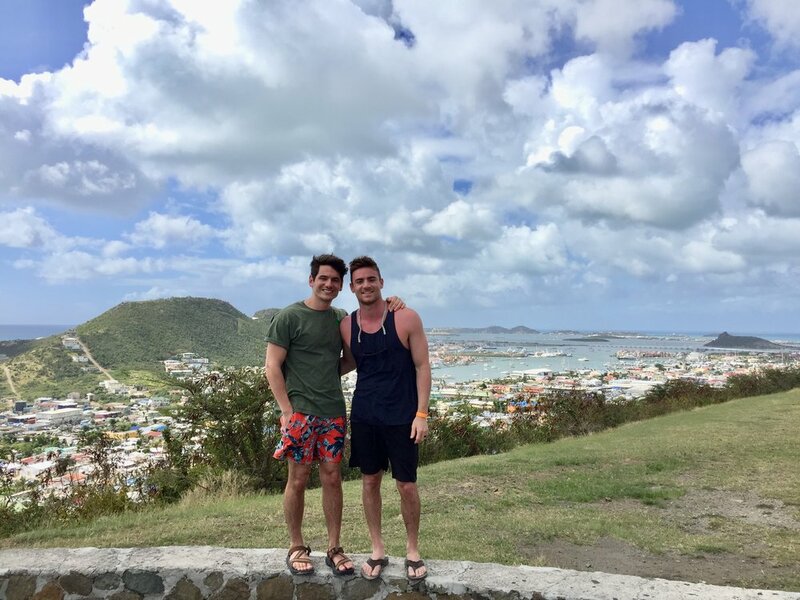 Our last port day was spent in St. Kitts, another beautiful island in the Caribbean. 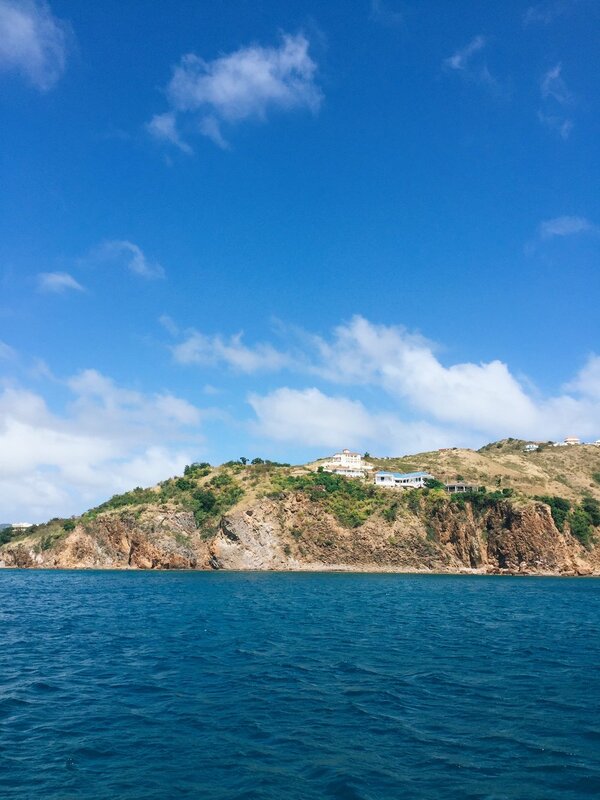 This was probably our favorite excursion we experienced because we had to travel by a catamaran to get there! 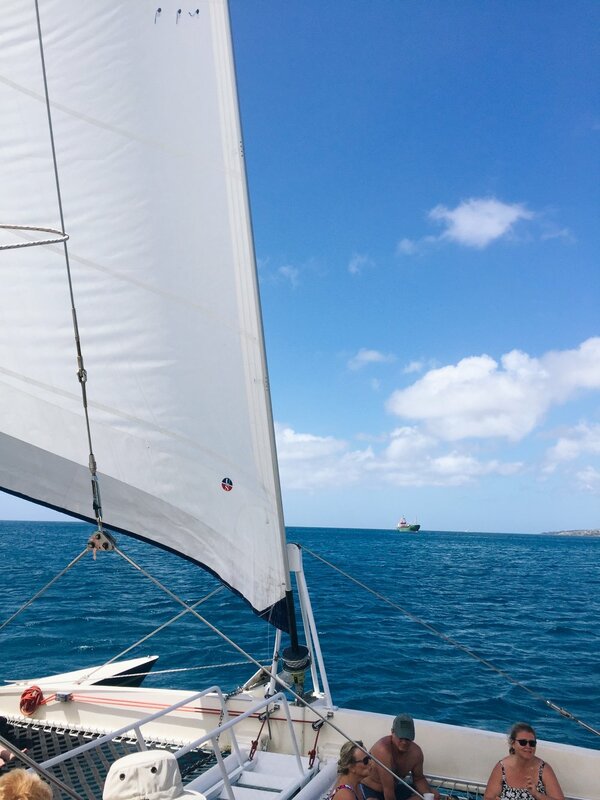 Neither of us had ever been on one before so it was such a treat to sail the 45 mins from St. Kitts to a little cove with clear blue waters and lots of fish. 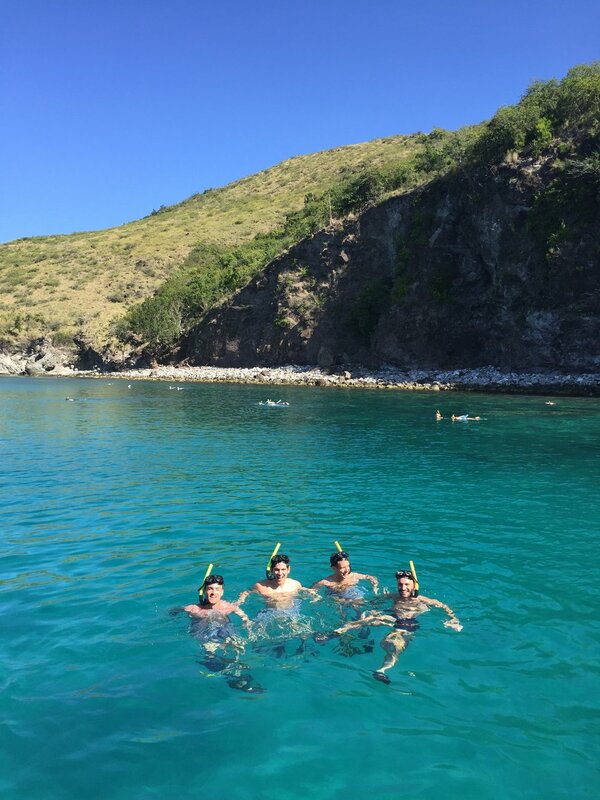 We snorkeled with the guys and drank a locally made soda called Ting, a grapefruit drink. Snorkeling is no joke. Have you ever been? It actually takes a lot of lung capacity and we found ourselves short of breath a lot, but it was still a blast. We were wiped out by the end of it, so we hopped back on the catamaran and sailed back to the island. On the way back, we met some folks from Columbus, Ohio that were So. Much. Fun. 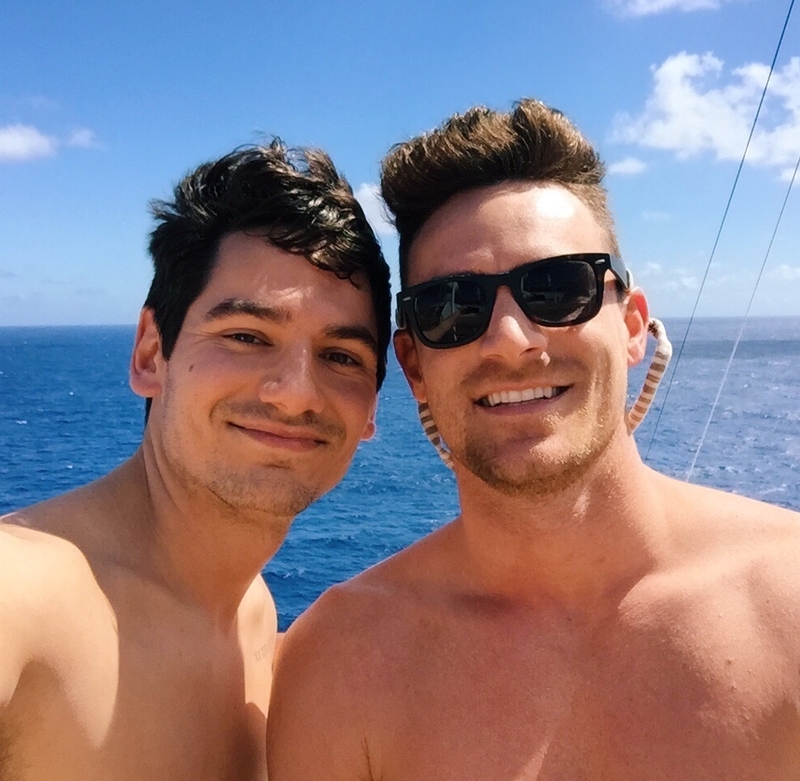 They told us how they’ve been going on cruises together for more than 10 years (there were about 14 in their group, all friends since high school). They told us about all the places they’ve visited like Europe and Punta Cana, about their kids, and best of all, how they will be at the home & garden show this month (!!) which is where we will be speaking at! Once we were back on the ship, we started settling in the make the 2 and a half-day journey back home, starting with an invitation to watch the sail off on the helipad. How cool is that?! The next two days were filled with lots of food, sun, shows in the theater, massages (thank you Nikky and Risper!!!! ), more food, pool parties, trips to Café el Bacio (our favorite spot for coffees and cappuccinos) and walks around the ship at night. Every night we went to a new restaurant and experienced different cuisine that was equally as good as the previous one. 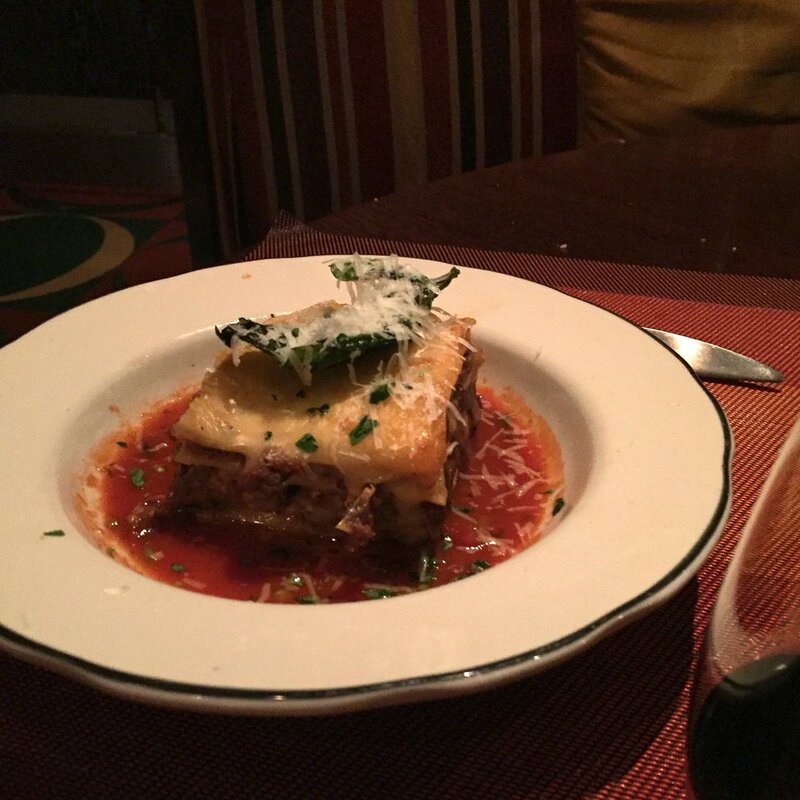 The first night we went to Tuscan Grille, an Italian restaurant with low lighting, candles, and such a sweet staff. We got the lobster alfredo and lasagna and man was it delicious. The next night we went to Silk Harvest, which served Asian cuisine, and they had the best shrimp tempura we’ve ever tasted. We also visited Murano, a French restaurant and also got the lobster there. 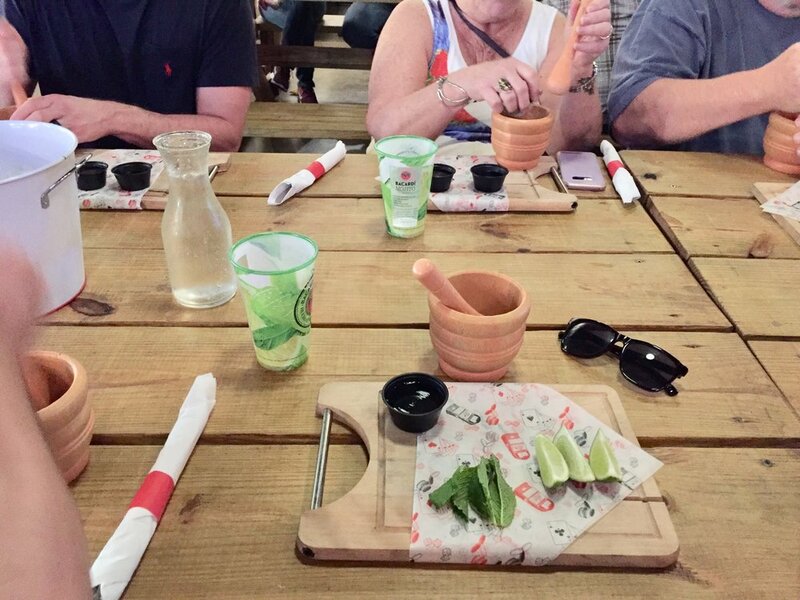 They grilled it right in front of you and the whole place smelled like garlic and butter. Does it get any better than that? We decided to try out Sushi on 5, their newest restaurant on deck 5 and it was amazing. It was so amazing, in fact, that we went back 2 more times after that haha. Also worth noting is that we went back to Tuscan Grille again for dinner because it was that good. For lunch and breakfast, we mostly stuck to the OceanView Café, a huge cafeteria with every type of food you can imagine. Have we mentioned how we ate too much on this trip? It’s crazy how a cruise ship operates. It’s like a little city, with SO many people operating it and working together to make it function. We got to know the staff and looked forward to seeing their familiar faces every day. Rex, the man who always made sure to turn down our room each night before we got in. Alexander, the executive head chef who was kind enough to give us a private tour of the kitchen during peak dinner action. Madalina, the sommelier who knew exactly what kind of wine we should drink with dinner each night. Miguel, one of the ship executives who kindly escorted us onto the ship and shook our hand every time we would pass him onboard. And even our favorite singer on the ship, a girl & guy duo called Devico, who had the most beautiful voice we’ve ever heard. It makes you feel like you’re not in the middle of the ocean, miles and miles away from civilization, when you have such amazing people to look forward to seeing every day. So all together, this cruise was amazing. Just the idea of visiting different countries, meeting so many different people from all over the world, sharing the sea with strangers (at first) who become friends in 7 days, and being that far out in the ocean with nothing but blue waves all around you, it’s kind of mind boggling. It’s also wonderful when you can go with great friends. This is the third time in 6 months we’ve had the chance to hang out with Beau & Matt and we always have a blast each time we do. They’re absolutely hilarious and so smart when it comes to business. We’re lucky to know them. 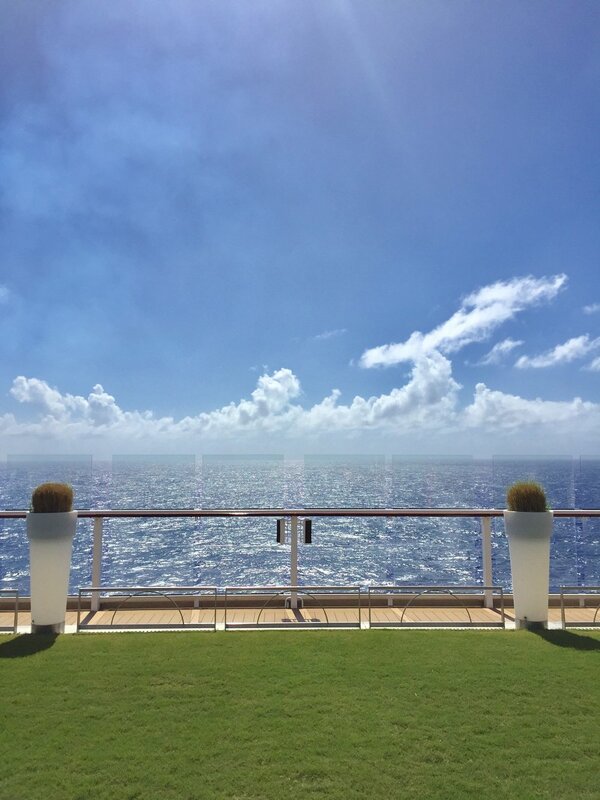 If you have never been on a cruise before, we highly recommend it after traveling with Celebrity Cruises. They're actually offering a special offer with their Sail Beyond Event, where you can save up to $300 on select packages plus unlimited WiFi. Click here to find out more about it! 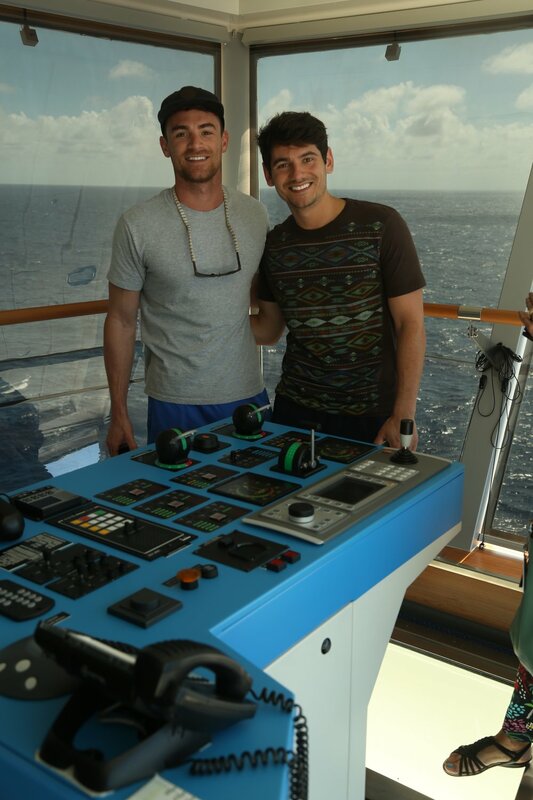 We want to give a HUGE THANK YOU to Beau & Matt from ProbablyThis, Elizabeth from Celebrity Cruises, and all of the staff and people behind the scenes who made this trip possible. We wont soon forget it and will cherish these memories forever. We are heading out on a little mini vacation for the weekend! We will post more about where we’re going once we get there, but it’s a city we’ve never been to before with an amazing culture and some great food. We snuck off last minute for a little mini vacation :). We will check back in with you guys in a few days for Feature Friday!